USArray consists of four interrelated parts. As the Transportable Array moves across the country, a pool of hundreds of additional portable seismometers is available to scientists for dispatching to specific targets for more detailed studies. These instruments might be set up, for example, to chart the magma chamber beneath Yellowstone, or to map the geologic structure deep beneath New Madrid, Missouri, to understand why big earthquakes occurred in the region. If these targeted arrays are placed in seismically quiet areas, scientists can use manmade vibrations produced, for example, by explosives in a drill hole or by a large ground-tamping truck, to cause ground motion that can be recorded by the seismic sensors. Even random, "cultural" noise can be used to image the earth. The dense instrument coverage enabled by the Flexible Array can be used map, in much greater detail, specific structures that are in the upper 70 km of the earth. USArray, in close collaboration with the US Geological Survey's Advanced National Seismic System (ANSS) has contributed to the establishment of a permanent network of seismic stations across the United States with uniform spacing of approximately 300 km (186 mi). The Reference Network provides the baseline measurements for the Transportable Array and Flexible Array. EarthScope is installing a small number of permanent and portable magnetotelluric (MT) sensors across the United States in conjunction with USArray seismic instrumentation. These MT sensors record naturally occurring electric and magnetic fields, which scientists will integrate with other geophysical data to identify Earth's thermal structure and to study the significance of fluids within Earth's lithosphere (upper ~70 km). 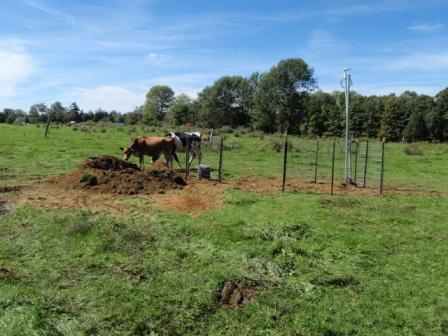 An MT station is passive with no associated noise or motion, and consists of a magnetometer, four electrodes, and a data-recording unit that are buried in shallow holes. The four electrodes are placed along two lines in a cross or "L" shape, oriented along north-south and east-west directions, and connected by a thin cable to the magnetometer and data recording unit which are usually at the intersection of the two lines. The electrodes are saturated with a common salt solution to improve conductivity with the ground.